The Sigma Outpost is a small patrol and geological survey outpost on colony EC-554 . The outpost houses crew of nine comprising of security personnel and company prospectors searching for amatium deposits. The outpost is well protected against local wildlife and rebellious native colonists. Oh man… I finally got this made 😀 The draft of this has been lying in one of my sketch books probably for a year and initially I was supposed to release this last month already, but I didn’t get this done in time. Again I’ve been testing new techniques. The lines were initially hand-drawn and later I drew over the walls, windows and doors on Photoshop to make them more straight. 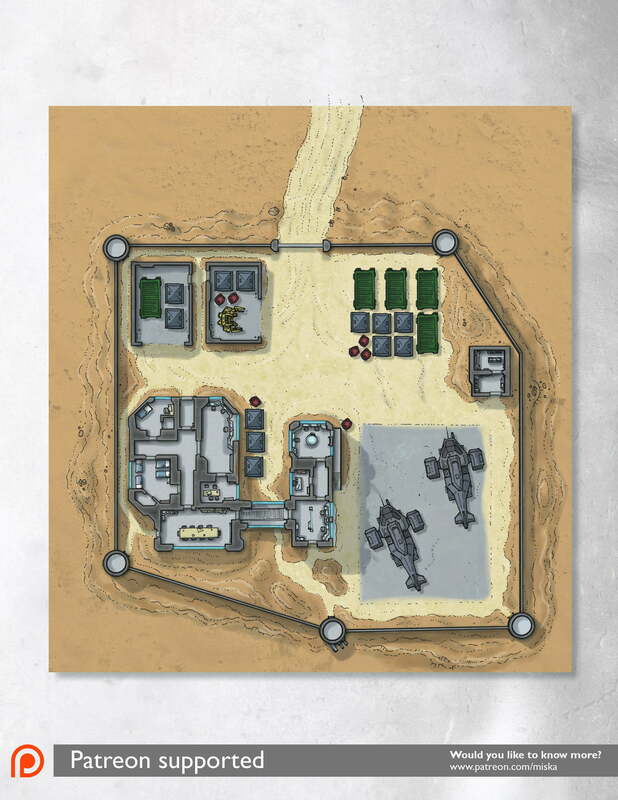 Finally I drew a template for the cargo boxes, choppers and the powerlifter and placed them around the map. Coloring was made with iPad and texturing again on Photoshop.